About four hours south of Lima, hidden in the middle of the desert and surrounded by sand dunes, is the village of Huacachina. About 100 people live in the tiny village yet it attracts tens of thousands of visitors per year who come to admire the "Oasis of America". Families enjoy visiting the small resorts to swim, paddle boat, and coat themselves with the mud, which supposedly has the curative power to heal arthritis, asthma, and bronchitis. The village, which has a slight hippie vibe, is also known to host good parties, attracting urbanites from Lima, looking to get away on the weekend. Local legend has that the lake was created when a beautiful princess undressed to bathe and saw in her mirror a male hunter approaching from behind. Startled, she fled the area, leaving behind her mirror, which turned into the lagoon. Other versions of the legend maintain that the lagoon was created from the pool of water she had been bathing in. The folds of her overcoat, which flowed behind her as she ran, are said to have become the surrounding sand dunes and the woman herself is rumored to have turned into a mermaid, who still lives in the oasis. Water stopped seeping into the lagoon in the 1980s and wells installed by nearby private landowners have further reduced the water level. Water began being artificially pumped into the oasis in 2015 and since raising the water height by 3 meters. As budget concerns and pumping restrictions have increased, the future of the oasis remains unclear. 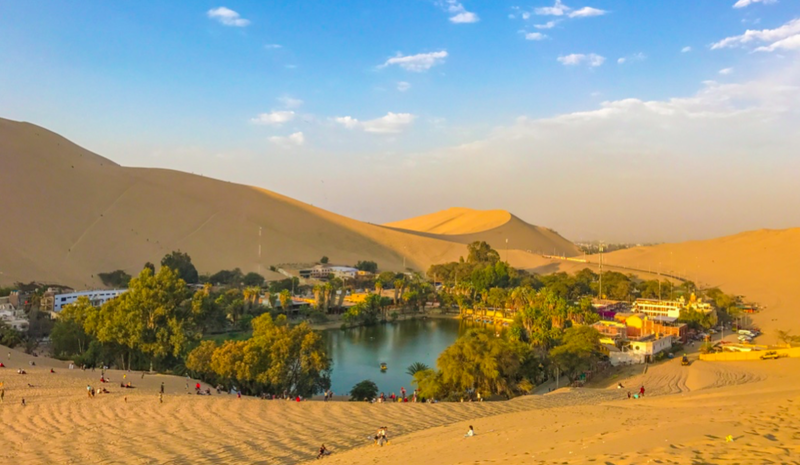 An increasing number of tourists flock to Lake Huacachina each year to speed through the desert in dune buggies and to sandboard on the dunes, some of which reach several hundred feet high. Before embarking on the dune buggy tour, I was warned to never take off my seat belt and to keep hold of all of my belongings. Tourists are known to lose their cameras during the rides and unsympathetic drivers do not slow down or turn around to recover them. I joined a family of 10 for a desert tour and was happy to have the front seat so the rows of 20-something guys behind me didn't block my view with their array of GoPros and selfie sticks. I attempted to take some videos but the buggy drove extremely fast and the bumpy desert terrain didn't make for good video. I intended to sand surf (standing up) down the dunes then lost my nerve when I saw quite how steep and high the dune was. Instead, I laid down, face-down, onto the board and glided down the sand dune. I knew immediately that I was picking up too much speed and my "guide" hadn't given any directions for how to stop. As he pushed me down the dune, he also confirmed that the board was too small for me. I knew it was only a matter of time until I lost control and proceeded to roll over several times, coating myself completely in sand, which I would continue to find throughout my belongings for the next two weeks. In the end, it was a ton of fun and a woman in my group shot an entertaining video of me. Listen closely and you'll hear her gasping when she sees me crash. 5 Things to do in Cusco, Peru: More than a pit stop on the way to Machu Picchu, this lively city is a starting point to explore ancient Inca agriculture labs, salt, mines and "rainbow mountains"